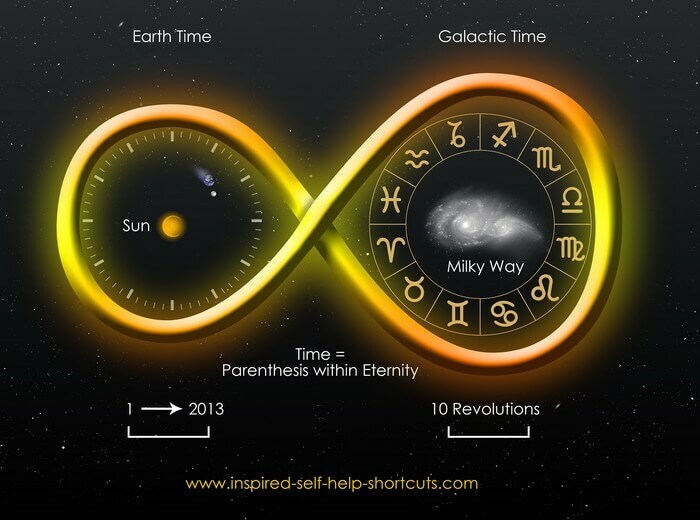 Inspired Self Help Topics Explore The True Nature Of Time! Inspired Self Help Topics Explore The Paradox Of Time And Reveal The Eternal Moment Of Now! The inspired self help topics on this page look into and reveal the true nature of time and how you’ve been programmed through your life experience to believe that time is linear. And then we’ll explore the paradox of time and I’ll show you why there’s really, truly, only ever the one eternal moment of NOW. And then perhaps you’ll begin to realize why all of your power is always right NOW in the present moment and thus you'll act accordingly. In addition, these inspired self help topics look at the recent discoveries made in the field of New Science and how people such as Bruce H. Lipton, Ph.D. reveal how the effect of stress on our body causes physical aging. And why living primarily in the present moment actually reverses the body's aging process. I'll also reveal to you that the past and future you believe to be so real are merely psychological illusions of your mind. Once you’ve grasped and really understood the messages revealed on this inspired self help topics page and you've fully integrated this new way of thinking and living into your daily life. Then perhaps you’ll come to realize why many of your health challenges exist to begin with, and thus you’ll be better prepared to avoid dis-ease and to solve any perceived health challenges as and when they arise. Since birth you've been fed many lies about the nature of reality. This has been achieved, generation after generation, through perpetual exposure to every kind of social conditioning by those people wishing to hold power over you, by keeping you from the actual truth and your true power. To be clear, no one actually has any power over you unless you hand it over to them, but for the sake of clarity let's call these people "the powers that be" (TPTB). I know you believe these things because that's what you've been programmed by TPTB to believe. That's right, for at least the past 70 or so years we've all been conditioned. And the primary tool of TPTB has been television, that's Tell-Lie-Vision, aka the mass mind control box. Through television news and other television programs as well as all kinds of other mainstream media, our minds have been steered towards certain directions desired by TPTB in order for them to meet particular objectives, such as more control and war. Turn on your television news right now to see their current objective. Why do you think it's called a program if not to program your mind? One of the ideas you've been taught to believe in is the idea of linear time, as if it's actually true and so you believe it. You see, when you buy into the idea of linear time this means that you believe in a reality that has a past, a present and a future that's fixed and thus unalterable. And in turn, you automatically believe that you are as you are now due to what came before in the so-called past, and thus you believe that the idea of "history" will also affect your future. For instance, your parents had an illness and because you have their genes (from the past) you will also get this illness. The paradox of reality is that while our experience of linear time is real, time always exists NOW! As you can see from the video, from one perspective events have already happened and from another perspective those very same events have not yet have happened. This is why it's possible for a seer, such as Nostradamus, who gazes along a timeline and reads energy can predict a probable future event. However, it's important to understand that upon knowing about the probable "future" event we can change direction and thus not experience it. From a non-physical perspective time is like a marker for an event. Those events do have a beginning and an ending, but they are cyclic and perpetual in nature. Within the idea of NOW there are infinite timelines consisting of events in time. The negative so-called elite or TPTB want us to continue along a particular timeline in order that we'll experience certain events that fit their overall negative agenda, hence the mind control through television programming. At the end of the day all reality reflections are illusion by nature, but it's up to each individual to decide and choose whether they prefer to experience a positive or negative "future" event by what they believe. Always remember that fundamentally beliefs create reality experience, so change your beliefs and your reality must change! In order to incarnate into this time-space reality we all had to agree to play by its rules. Hence, we're conditioned to believe and so we believe that chronological time marches forward and thus we label ourselves as 14, 35, 56 or 91 years old etcetera. That is to say, we agree to live by and abide by the rules of chronological time or time of the clock and we choose to keep track of the years as they seemingly pass us by, as if that's an ultimate truth. This image represents growth and change as we move through life. However, while it’s true that from our physical perspective of this four dimensional space-time reality (4D) we experience existing within the idea of chronological or linear time, as we awaken from the game it’s worth remembering that this reality is only one of an infinite number of probable realities available for us to experience. 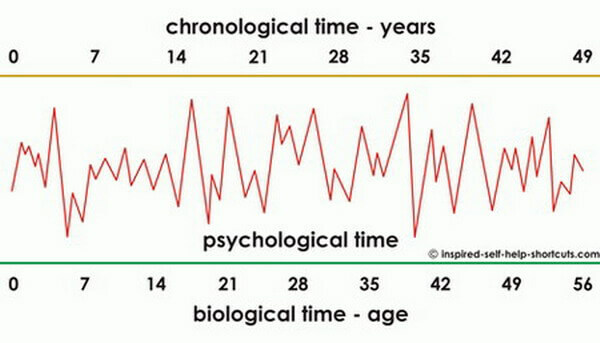 So linear time marches forward and your body ages according to your expectations, but notice how, psychologically, you never feel any older - no matter how many physical years have passed? 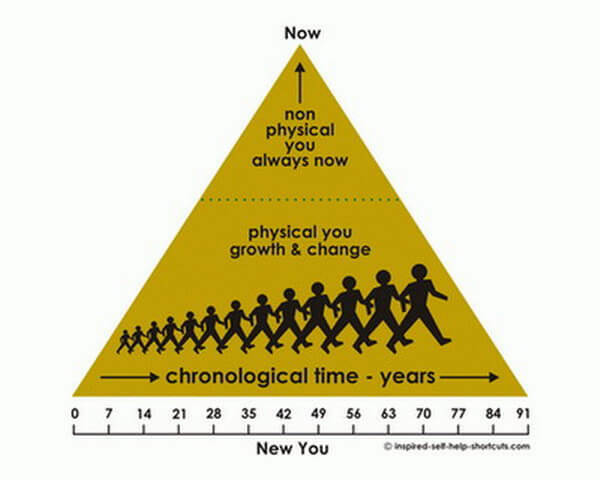 This self help topics insight suggests that this is because from the perspective of our non-physical self "time" is not perceived in a linear fashion. No, from the viewpoint of our spiritual consciousness or higher self (who we really are) chronological or linear time does not exist in the same way, all time is perceived as happening NOW. Read 'The Power of Now' by Eckhart Tolle for a very clear and great explanation why all of our power lies in the eternal moment of NOW. Now, let’s explore these inspired insights and shortcuts further to understand stress and how to look younger than your biological years. While we all agree to use the idea of time and, by definition, space to navigate through this four dimensional (4D) time-space reality, time, like matter doesn’t have an independent objective reality of its own, but rather we (as consciousness) create the idea of time to exist within. Remember those times when you were so absorbed in doing something that you enjoy or love doing a lot and being shocked as to how much time had passed once you’d finished what you were doing? Perhaps you thought an hour had passed, but when you looked at the time four hours had actually passed and you couldn’t quite believe it. The reason for the seemingly "missing time" is because when we're passionate and only do the things we love doing, the things that excite us, then less time needs to be created by us in order for us to experience those things in our lives. That is to say, absent all of the endless details (more time) needed to do and fulfill things that we don't really want to do, less time is needed to do those things and so our experience feels like time passed quickly. Dr. Bruce Lipton proves, through his work and discoveries in New Science, that it’s our individual response to our current perception of reality, through our beliefs, either conscious or unconscious, that determine our experience of reality. And therefore, that our genes (from the past) do not determine the physical state of our body. This new understanding throws the whole idea of hereditary limitations out of the window and indicates that it really is a "Belief Driven Universe!" It’s estimated that each of the 50 trillion cells in our body is renewed within each 7 year period (the brain cells being the oldest). Thus, a totally New You is created every 7 years. Though controversial, I've indicated 7 years as the life of the oldest human cell as that seems to be the most common conclusion. It’s easy to tell when someone is highly stressed, because they’re always doing something, anything, and they never seem to have enough time to do all of the things they want to do or feel they need to do or must do. And as a result they’re not happy and they experience pain in their body. Study the images below and contemplate your own life and how much stress you're allowing to consume you. Then ask yourself: do I really want to change that and thus live a more relaxed life in which I’m happy and feeling good for most of the time? The choice will always be yours! stressful life can lead to an increase in the biological age of a person. These images represent the idea of either doing what you love to do and living in the NOW moment, thus creating less time. Or living in ways where more time always needs to be created in order for you to complete your tasks and do all of the things that you believe you must do, along with all of the details associated with your beliefs. Put differently, these images represent and indicate the effects of living a psychologically relaxed life and being in balance and harmony with your true nature or living a psychologically stressful life and being out of balance and harmony with your true nature, thus creating dis-ease. relaxed life can lead to a reduction in the biological age of a person. Whatever we think, say or do we do it now. If we think happy or sad thoughts we do it now. If we think about our health or our partner or wealth we do it now. Whatever we do we do it now, we always have and we always will. And the thoughts we choose to think right now dictate the vibrational state of our being, which in turn creates our future NOW reality. This is why the eternal moment of NOW is where all of our power lies and nowhere else! Further, when we think about the past or the future we always do it now. However, while you might believe that the past and the future that you imagine are real they are merely memories from your psyche; they have no validity outside of your psyche. In truth, the actual past and the actual future all continue to exist simultaneously outside of your psyche - right here within the eternal moment of NOW. Linear time is merely an idea or a parenthesis within eternity! 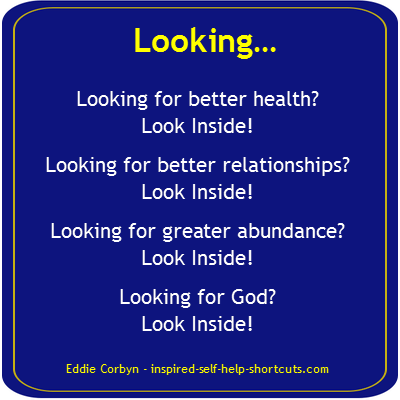 These inspired self help topics observe that because all of the cells in our body are completely replaced by new ones every 7 years, obviously, our consciousness is not contained exclusively within our cells and in fact it never ages! 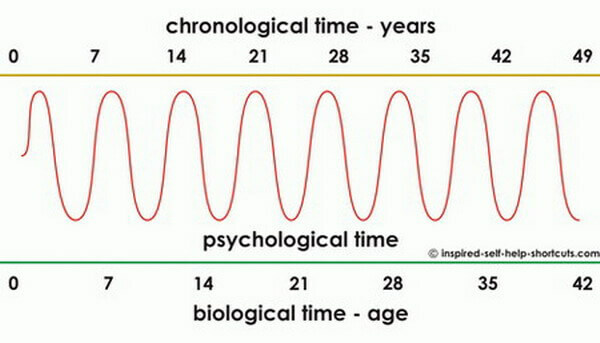 How you choose to perceive time psychologically is really up to you. However, if you do your best to remember to live in the present moment you'll feel better and look younger than your years, guaranteed.